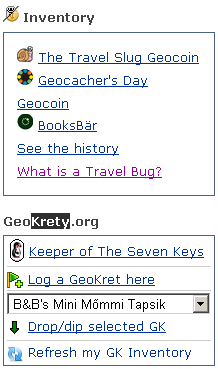 GeoKrety (From Greek geo = ‘earth’, and Polish krety = ‘moles’) is a service similar to TravelBug(TM) or GeoLutins, aiming at tracking objects you leave in geocache containers. People move these registered objects (called GeoKrety) from cache to cache and register each move with this service. The trip of each GeoKret is then presented on a map. GeoKrety are not a trade item, you do not have to put something in the cache to take a GK, and you should not take something from a cache in trade for a GK. If you should take something from a cache, you should make a trade, and you can place the GK. The service is absolutely free (contrary to TravelBug) and easy to use. A GeoKret can be anything, but in most cases it is a small puppet. Please see (and edit, if necessary) the article about geokrety at Wikipedia. Watch an instructional screencast about registering and making your own GeoKret. Register the GeoKret and note down the GeoKret Tracking Code (eg XF3ACS) generated by the system. This code is secret and only you and people who find this GeoKret should know it. Have fun watching the trip of your GeoKret! A book/CD/DVD/... - when you want to track books, CDs, DVDs dropped to cache containers. Just stick a GeoKret number and a short instructions on the back side of a cover. Take a card (which can be a postcard, but also a home-made card) and write a few lines for the receiver on it. As recipient address the nick name of the recipient, the region (country, district, city) and give a target cache (best with all available waypoints - GC-code, OC-code, etc.). (optional:) Laminate the finished postcard to protect it during the journey. or I've dropped a GeoKret - when you've left a GeoKret in a cache. or I've grabbed a GeoKret - when you've taken a GeoKret from a cache and are not going to put it to another cache soon. or I've met a GeoKret - when you've met a GeoKret in a cache but haven't taken it with you. The number of waypoints and the time of a last update for each database you can find here. But maybe in the future we will be able to do more. So enter the waypoint anyway. - Mozilla FireFox (from version 3.5), you also need Greasemonkey Add-on. Install GKT for Firefox here. - Google Chrome. Install GKT for Chrome here. 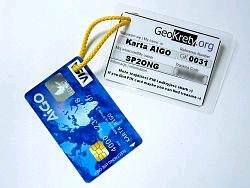 You also need an account on geokrety.org. 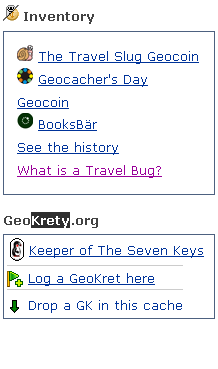 After installing GKT in your browser, you will see an extra [ GeoKrety.org ] panel on the right hand side of every GC cache page. From the list of GeoKrety pick the one you wish to drop and click "Drop selected GK" - you will be redirected to the standard logging page with both the GC Code and coordinates already filled in. Check the date, add a comment and you're done. 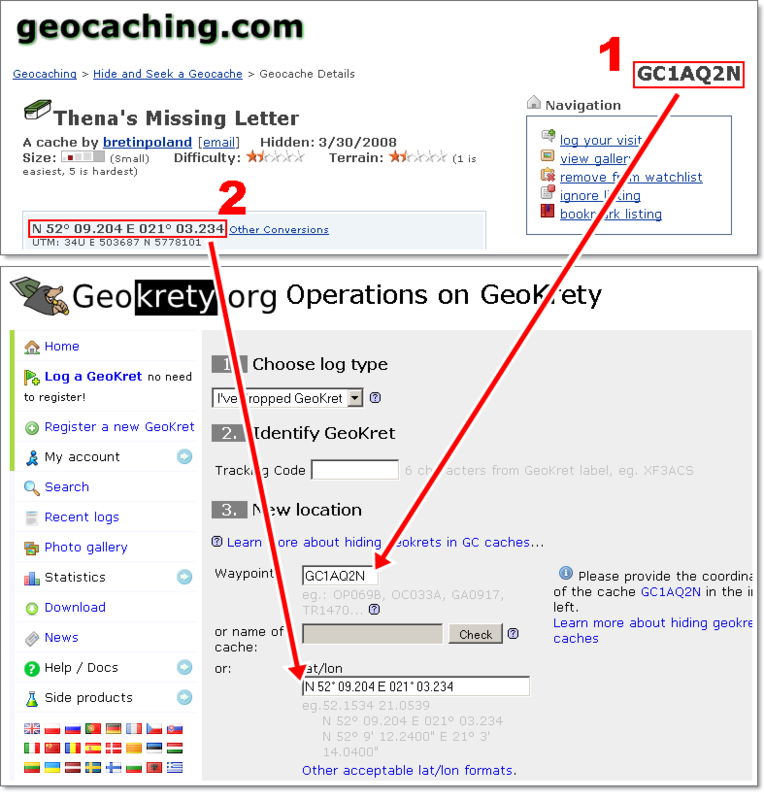 in the waypoint field, enter the GC Code of the cache (eg. GC1AQ2N). I have checked with Brian, and his definitive answer is that these 'rogue' TBs are not of concern to us - reviewers and GS staff. 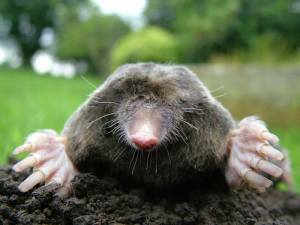 We cannot govern their usage, and Geocachers are allowed to give out GC codes. N52° 12' 18.74", W21° 11' 27.21"
52° 12' 18.74", -21° 11' 27.21"
Reference Number e.g. GK003F. It is a public number that may be used to refer a GeoKret. It consists of 'GK' prefix and 4 digits in hexadecimal system. You can use it to search a specific GeoKret or to link to this GeoKret. It is visible to everyone. Tracking Code eg XF3ACS. It is a secret identification code which is required to post logs such as "Grab", "Drop" and others for a GeoKret. 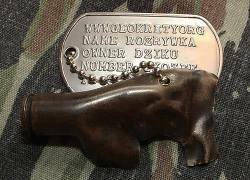 Only the owner and geocachers who found the GeoKret should know this code. It is not recommended to post it anywhere. 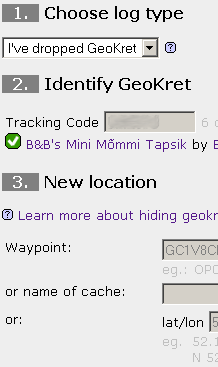 Of course this code must be written on GeoKret's tag to allow finders to log it. Thanks to SRTM and GTOPO30 elevation data and lat/lon to country code conversion (geonames), each trip point has assigned an altitude and country code (a flag). According to that data, the altitude profile is drawn. Above data and plots are updated every 10-15 minutes. For easy logging dropping or grabbing during your trip, I've added the possibility of attaching QR code on the GK label. QR Code is a kind of bar code, which can be "scanned" by your mobile phone, which will redirect you to the proper page at geokrety.org; you will not have to enter the tracking code, everything will be encrypted in the QR. Read more about QR Code. The QR code with encrypted address of geokrety.org page. Log the grabbing or hiding the GeoKret. The tracking code will be indicated by the url. Your e-mail address will be not transferred to third parties. Your password is one-way encrypted, so it can not be revealed. However, if you would like to, you can change your cookie settings at any time in your browser. You can use secure connection (https) with our server: https://geokrety.org or use a padlock icon at the bottom of page.